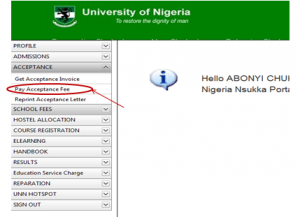 University of Nigeria, Nsukka acceptance fees payment portal | How to Pay UNN Acceptance Fees Online. 1. 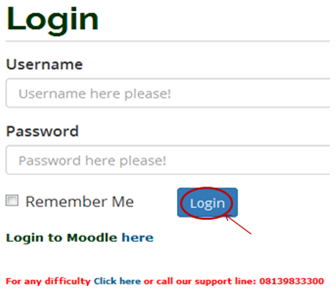 Type in the address bar on your browser (unnportal.unn.edu.ng) as shown below. 2. Press the enter key on your keyboard, the following screen will appear. 3. Type in your registration number as the username, type in your password, then press the enter key or click on the login button to see the following screen. 4. 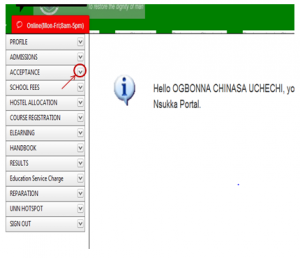 From the menu items on the left, click on the drop down button on “ACCEPTANCE” as shown above, to see the next screen as shown below. Observe the dropdown menu under “ACCEPTANCE”. 5. 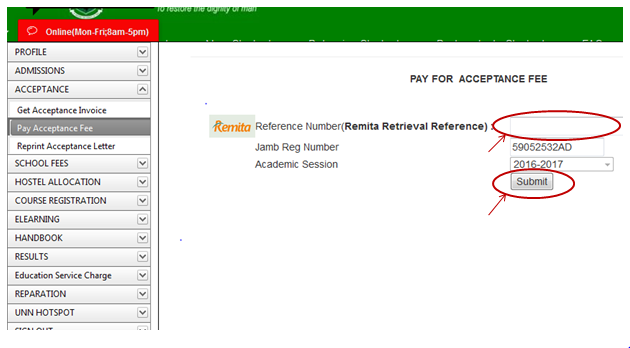 Click on “Pay Acceptance Fees”, as shown above, the screen below will appear. 6. 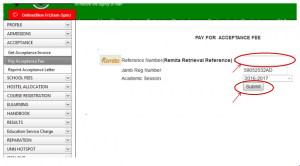 Following the” School Fees Payment Procedure”, enter the RRR number in your bank confirmation slip (which is the same with the RRR number in the invoice you generated) in the “Remita Retrieval Reference” column, as shown above. Click on “Submit” button and your Acceptance fees receipt will appear. 7. Print out the receipt.